With generic recommendations of increase fiber intake, reduce calories, watch fat content, and list goes on and on… Eating healthy can be challenging. But by understanding and learning how to read a food label, consumers can select products to align with their health goals! Nutrition facts labels include the three core macronutrients, including carbohydrate, fat, and protein. Carbohydrate is broken down into dietary fiber, total sugars and added sugars, while fat is often subdivided into saturated and trans fats. Individuals should reduce the intake of sugar and saturated and trans fat products (mostly in packaged snacks and sweet treats) and opt for foods rich in dietary fiber and protein. Acting as nutrient references, percent Daily Values (% Daily Values or % DV) helps consumers visualize how a food fits into their daily diet (based on 2,000 calories). Percent Daily Values are provided for all macronutrients and micronutrients included on the nutrition facts label. As a general rule of thumb, select foods higher in fiber, vitamins, and minerals (20 percent or greater) and lower in (less than 5 percent) saturated fat, trans fat, cholesterol, and sodium reduce overall disease risk and optimize health. One source of the food contains at least 20 percent of the Daily Value. For example, a “high source of fiber” indicates at least 20 percent from fiber. Though the Nutrition Facts label offers invaluable information, the Ingredients list must not go unnoticed. The list of ingredients starts with the most prominence and continues to the ingredient included in the smallest quantity. Most health experts recommend the “rule of five,” which encourages consumers to select food products with five or fewer ingredients. They further stress the importance of quality ingredients, aiming to select products with familiarity and a high nutritional value. Listed ingredients also useful if trying to avoid or limit a certain ingredient such as gluten, lactose, high fructose corn syrup, and other common allergens, intolerances, and innutritious items. Label definitions are mostly concise statements that offer quick insight at a glance, including the common definitions of “low in,” “calorie-free,” “sugar or fat-free,” and “good source of.” However, it is important to tread caution with label definitions, as a “sugar-free” food item is not necessarily a healthy product and may be filled with unhealthy fats and artificial sweeteners that may cause gastrointestinal distress. Healthy eating goes beyond the nutritional quality of the food and also focuses on its safety. 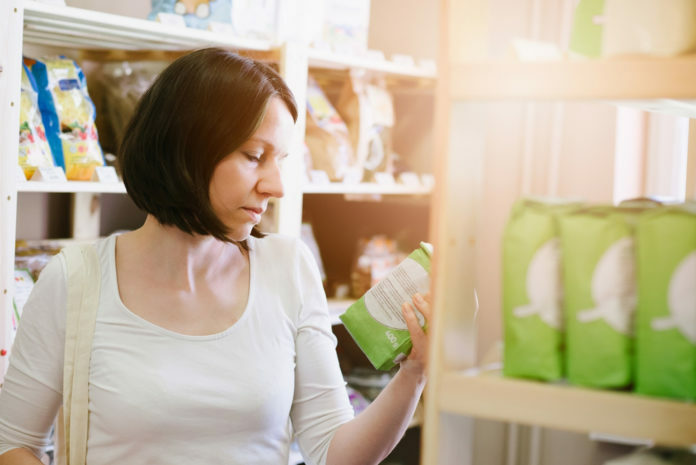 Purchasers can reduce their risk of food poisoning while prompting best food quality by utilizing the “sell by,” “use by,” and “best if used by” dates indicated on the package. But as a general frame of reference, the fresher the product and what is considered to be most healthful (think dairy products, meats, fruits and veggies), the quicker the expiration date.